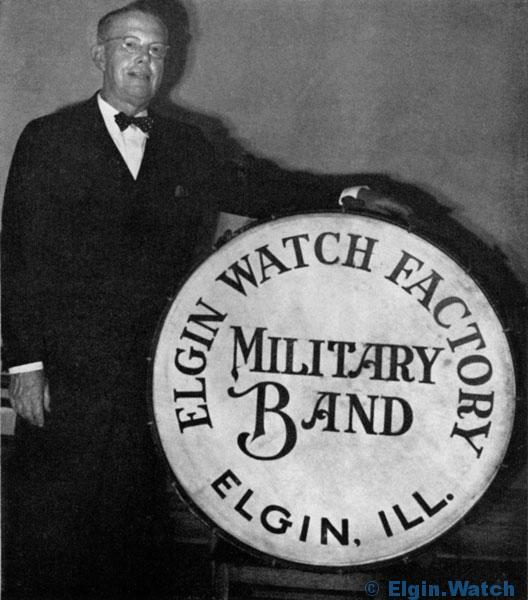 ENWCo were not the only American watch company to have their own Military Band throughout the history of watch manufacturing in the USA both Illinois and Waltham also had Military Bands. 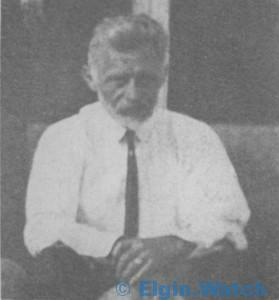 This chapter of the Watch Company deserves more of a story than has been presently published on the internet and it has only been briefly covered in existing books to my knowledge. Elgin after using the Almanac for several years as their primary advertising market; saw the market being flooded with other magazines and decided that they needed another form of advertising.1)The Watch Word, 75th Anniversary Edition They decided to take on the debt of the old Elgin Military band that had been organized in 1878.2)The Watch Word, August 1925 The most likely reason they decided to take on the band and it's debts was the fact that at least one employee was an original organizer of the Elgin band and several employees were already members of the band. Just how popular was the Watch Factory Military Band ? "Finest band in the world"
"That Hecker is a prince of conductors"
"One might almost regret, indeed, that such admirable harmonies were expended on the somewhat in harmonious politicians"
Like orchestras of exceptional merit "The Elgin Watch Factory Military Band" is not a temporary or changeful combination of musicians. On the contrary it is a growth - a development - as are the great Marine band at Washington, D. C., the beautiful Mexican band also now in this city and the various royal military bands that are the pride of certain European capitals. 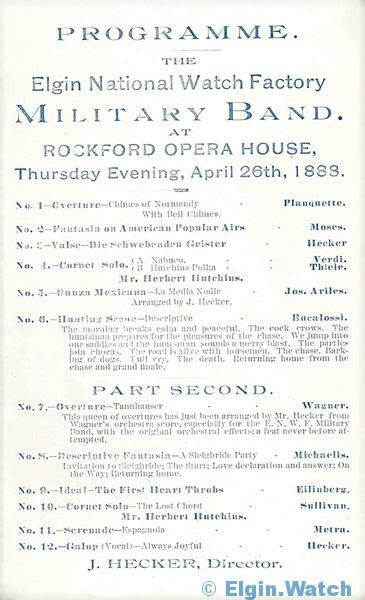 Consisting now of an ensemble of seventy six performers, all admirable musicians and drilled by Professor Hecker into a sympathetic union of sentiment and execution, this Elgin band was first organized with thirty members in the year 1875. Aiming no less than the highest standard of excellence its members rapidly increased, many amateurs of considerable skill being attracted to the Elgin watch works, chiefly by this opportunity to enjoy and cultivate their darling science. 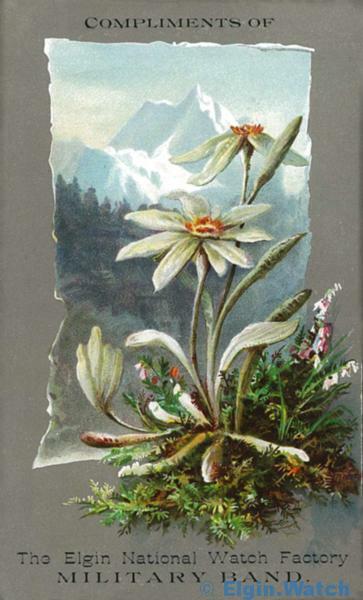 This the organization became speedily noted, and the success of its exhibitions was marked as t suggest the expedience of procuring for its director of real musical eminence, who could give to this material both soul and form and lead it on to achievements in the very empyrean of "this divine art." For this purpose Europe was carefully scanned, and the well-advised choice fell on the young bandmaster of the Eighty-second British regiment, Price of Wales volunteers, Mr J. Hecker. 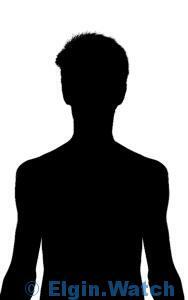 This gentleman was a native of Nassau, Germany, and - well, a born musician. Like all who have manifested great musical genius he early showed his predilection, and being placed under the most eminent masters was at ten years of age first violin of an orchestra, of which at fifteen he became director, and so continued, besides being organist of the cathedral in his native city, until he had reached the mature age of twenty!. The English are decidedly among the keenest critics and most liberal patrons of the art, the young professor turned to seek fame and fortune. 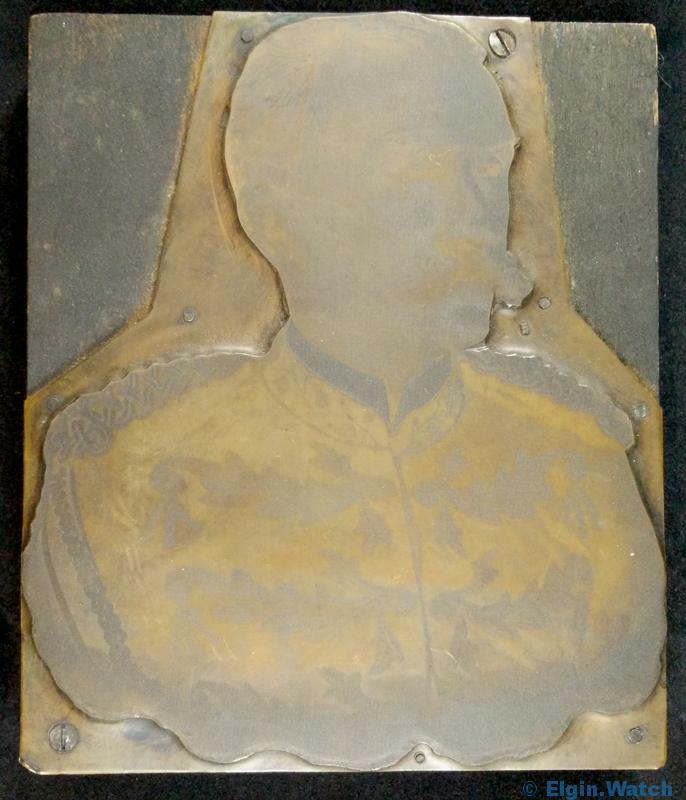 He soon won an instalment of both, being almost immediately chosen as civilian bandmaster of the regiment. Here he at once delighted the connoissuers, not only by the matchless discipline of his band but by his introduciton of a much highger order of compositions than had hitherto provailed with it and its kindred organiztions. He was a missionary of art, and his admairably arranged selections spread the infection of his taste. String basses, which he was the first to incorporate into a military band, were very soon familiar in the British regiments, He put forth hundreds of original compositions, charmingly conceived, and at the age of twenty-two amazed the musical world by arranging for his badn the symponies of Hadyn and Beethoven, and published and performed them, too, with brillinacy of success tat not only drowned criticism, but made them henceforth a feature of the library of every first-class band of sufficient numerical strength. The prior version defiantly had more panache; regardless of how he came to the watch company; it was a winning combination that brought great advertising to the company. The following are just some of the performances of the band that we have identified. We are sure there are more and if you can add any to the list, please feel free to contact us and provide the details. 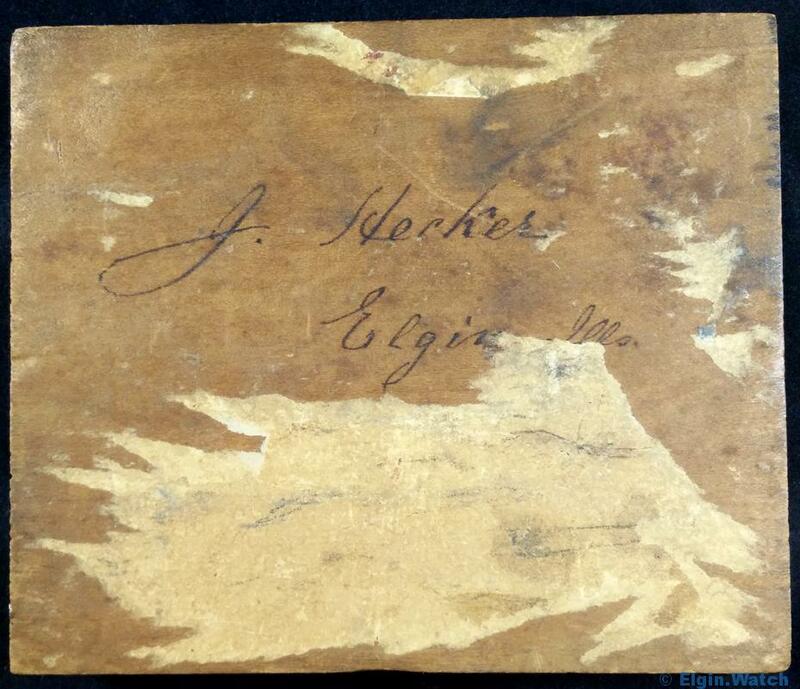 It was reported that the Elgin Watch Factory Military Band and Professor Hecker had an estimated 6,000 songs at the disposal. 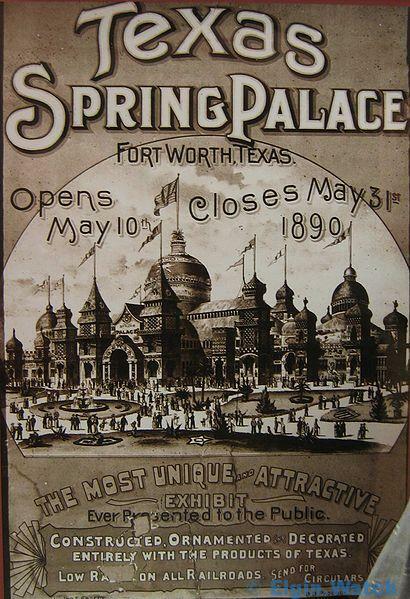 During the week of the Texas Spring Palace, they were kind enough to publish the music programme for the band in the newspaper for each day's concerts. Danza Mexicana - Chloe - H. W.
On the last night of the Texas Spring Palace, tragedy struck in the form of a fire that quickly spread through the wooden structure. 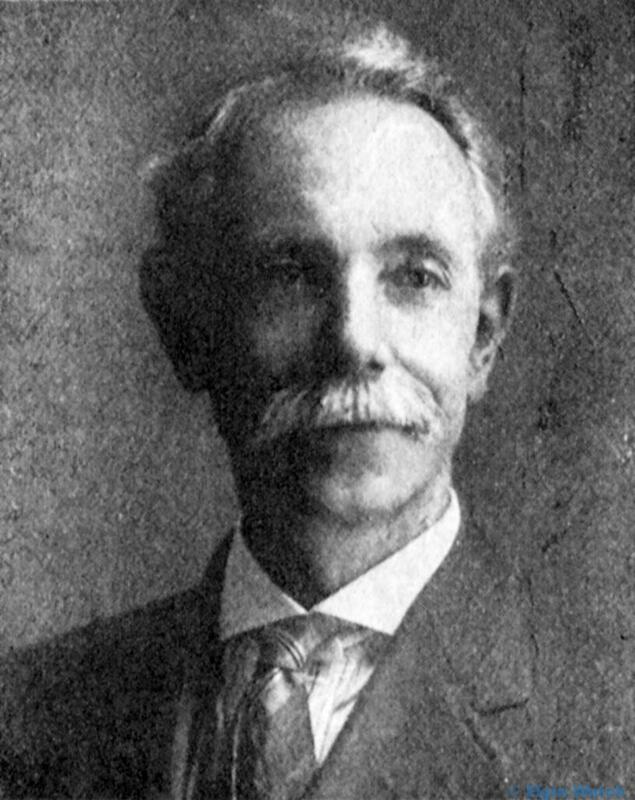 It took just 4 minutes to burn the wooden structure to the ground, amazingly out of the 7,000 guests, there was only one death as a result of the fire, Alfred S. Hayne who gave his own life rescuing other people. You can read more about the monument to Alfred S. Hayne on this blog post. The fire happened during intermission or just after the Military band had finished their concert for the evening depending on the articles you read. This was a substantial loss for the Military band as you can imagine and an even greater loss for Alfred S. Hayne. In 1947 the bass drum was presented to the city of Elgin by Merton W. Matteson of Harrison so that it might be provided to the Lord's park museum. The Watch Factory had the drum restored to its original state and through the co-operation of the City of Elgin, placed it in the Lord's park museum. 7)The Watch Word, December 1947 Posing with the drum is Edmond E. Fish (Machine department Jobmaster) who's father Augustine Thomas Fish played the bass drum with the Military Band. While researching it became quite apparent that Hecker's four children were quite talented and naturals when it came to music. 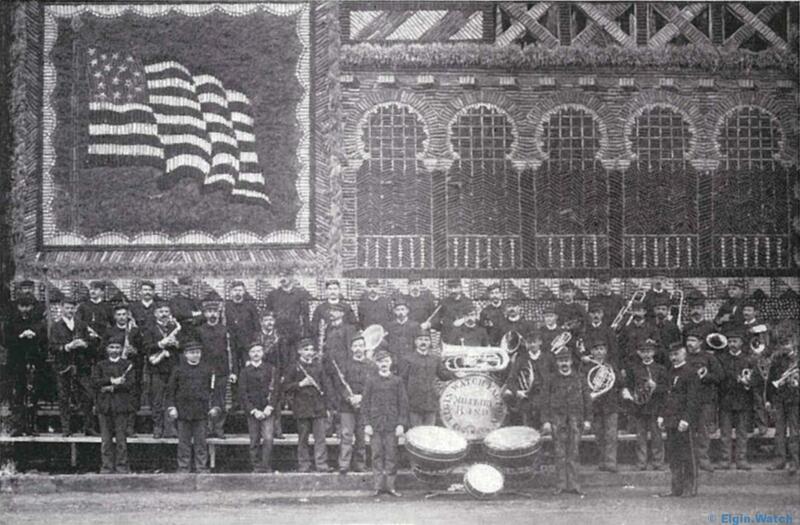 During the later performances of the Watch Factory Military Band it wasn't uncommon for his children to be listed among the performers or them having their own program before or after the Military Bands.